This polenta crouton salad was my dear friend Carole's idea. Carole is the editor of PhamFatale.com, and someone recently gave her the title of "Literary Swiffer," which I completely approve of. She always comments on the meals I feature on the website. When I posted polenta fries, Carole suggested another version I hadn't considered. She used to eat at a Mexican restaurant in San Francisco that served polenta croutons in their salad and she told me she could have made a meal on the croutons alone! 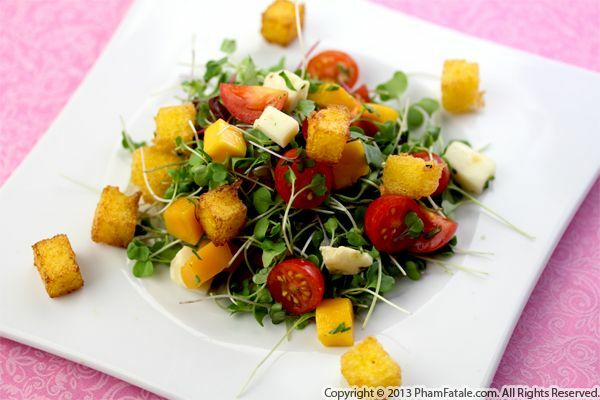 To make the dish, cubes of polenta are deep-fried until crisp and tossed with mixed alfalfa sprouts, home-grown Sugar Sweet cherry tomatoes, fresh cubed mango and a bit of cheese. Thanks for the inspiration, Carole! Every year, the garlic festival is held the last weekend of July, in Gilroy, California. I think Lulu, the girls and I are going to attend this year. Today I was inspired by the upcoming garlicky event to make something to keep away the vampires. I sliced a slab of polenta into the shape of French fries and flavored the golden polenta fries with parsley and fried garlic. I nestled them in a cone of parchment paper. The sweet smell of garlic is intoxicating. 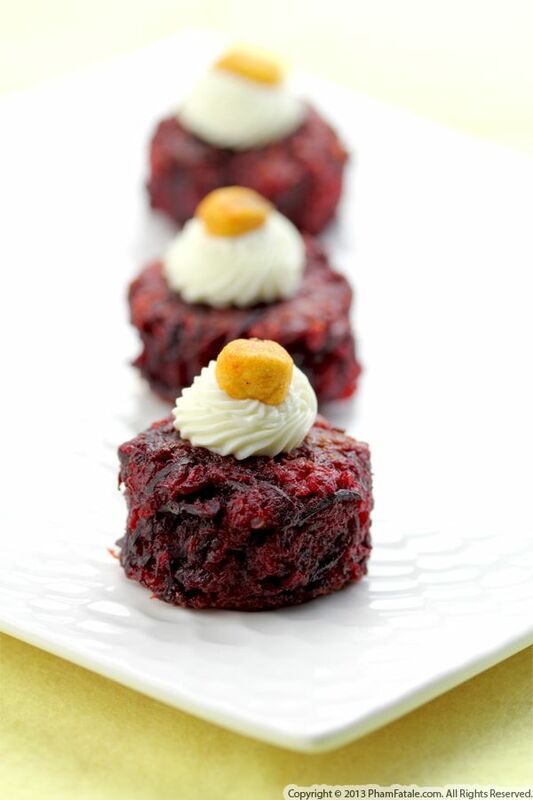 They can be served as a snack and they also make a wonderful summer side dish for any type of grilled meat. Plus, they are more nutritious than plain old fries. 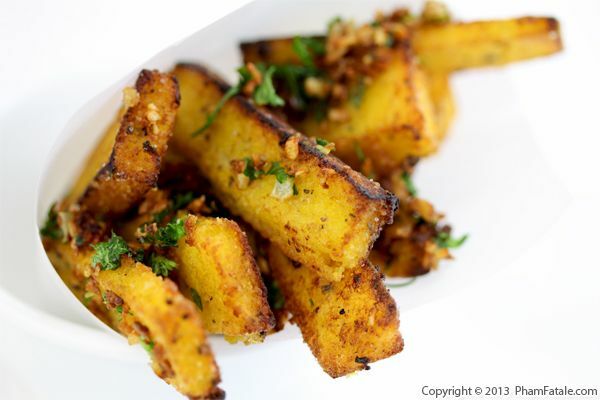 The girls were fooled and mistook the polenta fries for potato fries due to their crispy exterior and golden color. I’ll have to make more; they were fighting over the crumbs! You can catch me live today on Blog Talk Radio. I'll be talking about my favorite sandwiches and of course my new cookbook "Banh Mi" Wednesday, July 10th at 4:30 p.m EST. 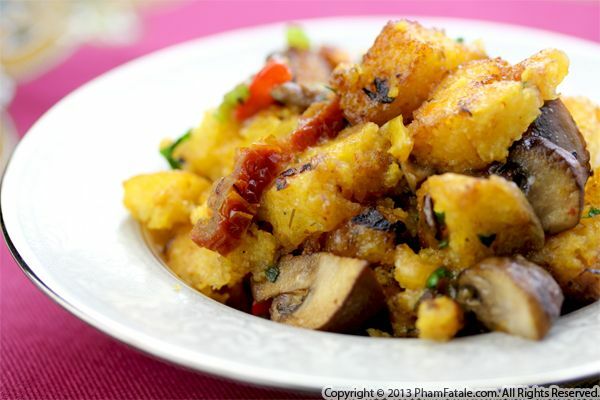 Polenta is a fine-ground corn that is pretty easy to prepare. It can either be prepared soft and creamy, or dry and firm. Personally, I prefer the consistency of the firm version. The preparation is fairly simple; just constantly whisk the cornmeal in liquid until each grain swells up, refrigerate and cut into slices. Right before you're ready to serve, place the polenta on a grill pan to create some nice grill marks. To create the perfect summer dish, I've paired grilled medallions of polenta with a creamy lemon caper goat ricotta cheese sauce. It's divine!